Many people, including students from all over the world, ask me about the Psychology specialty of Industrial/Organizational (or I/O) Psychology. Here is a post that lays out the field, the employment possibilities, and education and training in preparation for a career in I/O Psychology. Spoiler alert: I/O Psychology is the highest-paying area of psychology with the best employment prospects. Simply put, I/O Psychology studies human behavior in work settings. Like Clinical Psychology, I/O Psychology has both an “academic, ” or research, mission and an “applied” or practice perspective. Some I/O psychologists conduct research to better understand behavior at work, others are practitioners who help select employees, train them, assist organizations to change and innovate, and are involved in a number of programs designed to enhance work performance and the work environment. I/O psychologists can work as consultants to organizations, or can serve in-house in a variety of jobs. A common path is for I/O psychologists to work in Human Resources departments, but I/O psychologists can be found in nearly every large organization in all sorts of roles. Some job titles held by I/O psychologists include: Vice President for Employee Development, Director or Organizational Development, Quality Performance Manager, Staff Industrial Psychologist, and Testing Specialist. The usual professional degree is the doctorate (Ph.D., sometimes Psy.D. ), but there are a growing number of universities that offer masters degrees, and an MA or MS degree in I/O psychology can qualify as a “professional” degree in many areas. 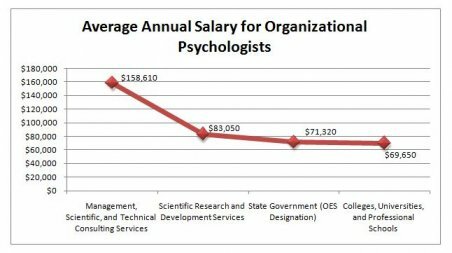 Because many I/O psychologists are employed in the private sector in high-level positions, the salary prospects and employment possibilities are quite good – the best among all areas of Psychology.